Kurt Cobain killed himself when I was in college. It was April 5, 1994, and his death was all over TV when I went to dinner with friends that night. Yeah, he was edgy and had some life drama, but suicide? It was a shock because it sounded gruesome and because it happened at the height of his fame? What went wrong? What made his life so painful he couldn’t live another day? 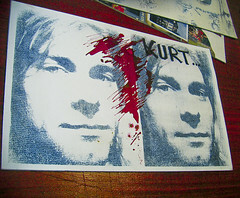 According to a family member, Kurt had been diagnosed with bipolar disorder. He also tried lots of addictive drugs when he was younger. He reportedly had a painful digestive disorder that went undiagnosed for a long time. He found that drug use finally gave him relief. Also, his parents divorced when he was eight years old. He began to withdraw and feel ashamed much of the time. He experimented with marijuana and heroin. In the early years of Nirvana, Cobain and future wife Courtney Love got to know each other while using drugs. The strain of performing and dealing with his stomach condition wore on him. And before long, he no longer used heroin occasionally. He was fully addicted to heroin. >>> READ THIS NEXT: Are You Helping or Enabling? Cobain finally went to drug rehab in 1992. However, his sobriety didn’t last long. He relapsed and survived a heroin overdose a few months later. In 1994, he had another drug and alcohol overdose. This was reportedly the beginning of the suicidal attempts leading up to his death. He was once reported to have a bottle of pills and a gun in the bathroom. Family and friends set up a drug treatment intervention for Cobain. He agreed to go to a detox center, but left not long after her got there. He flew back to Seattle, but family and friends lost track of him after that. Cobain was found dead in his home from an apparent shotgun wound. He had heroin and Valium in his body, and had been lying on the floor for days when police found him. I really enjoyed his music and wish he’d been able to give detox and drug rehab another shot. I wish drug rehab had been more helpful for him. I’m sure in some way his mental illness and drug addiction gave him a lot of fuel for his musical style and lyrics. They were edgy, raw, and sometimes embarrassing to say out loud. But that’s the world he lived in and it all became too much. Who knows how much influence Cobain and his band could have had in the future had he lived? Drug rehab might have even given him a greater variety of song material to work with. Or he might have given up the music industry altogether. Fame, love, success – none of it was enough to balance out his bipolar and drug addiction. It’s tragic, it’s confusing, and it’s unfortunately not uncommon for someone with bipolar and a drug addiction. Impulses are out of control, and drugs take away inhibitions. When a mood swing comes along and the person feels enough pain, it’s hard to know what they will do. For Kurt Cobain, it turned out to be the end. Drug Addiction – Whose Fault Is It?